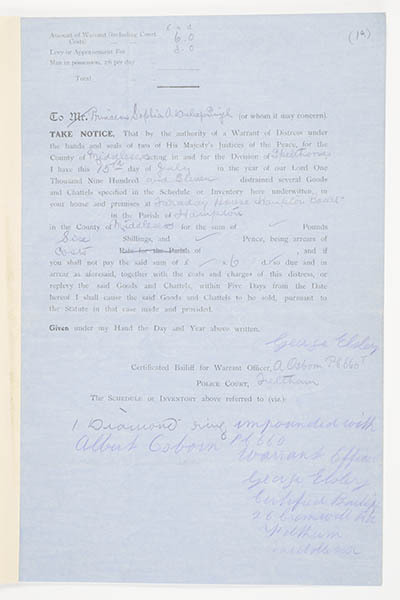 Copy of a warrant allowing for the confiscation of goods to the value of six shillings in lieu of taxes owed by Princess Sophia Duleep Singh. On this occassion '1 diamond ring' was impounded by the bailiff who called on her apartment rooms in Hampton Court Palace. As a member of the Tax Resistance League Princess Sophia Duleep Singh refused to pay taxes in protest against her lack of voting rights. The ring was purchased at auction by a fellow member of the Tax Resistance League and returned to her. 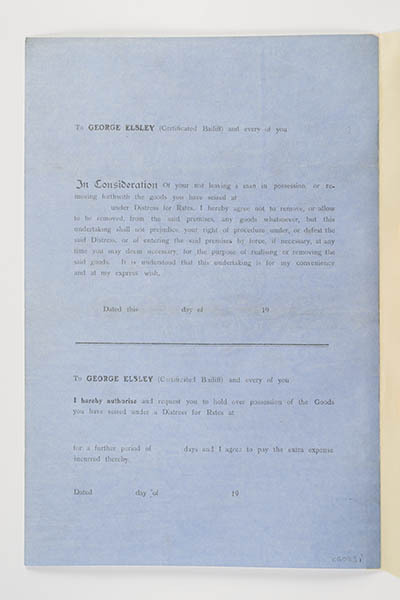 Not every record in Collections Online is complete. Some have low quality images designed purely for recognition, while some have been catalogued only to a basic standard. This graphic is designed to give you an impression of the quality of data you can see. 100% meets all our current data standards and has a high quality image, 20% is a basic record with no image. Individual record quality can change over time as new photography is carried out and records are worked on.